How do you know when a real estate market is increasing? If a client asked you how to know when a real estate market is increasing in value, what would you say? Prices going up is the first and obvious answer, but what else? There are a number of different metrics to watch, and the image below helps hit on some of the main issues. Anything else you’d add? Markets tend to change over time rather than in an instant, so it’s important to know which metrics to watch. It’s also helpful to listen to what buyers are saying. After all, there is something about consumer confidence and the mood among buyers that cannot always be captured in one neat little metric. The other big question we must ask is: Why are values increasing? Remember that an increase in housing supply or interest rates can change the direction of the market in a heartbeat too (especially after the Spring seasonal market fades). This is why it’s also important to know the signs of a softening market. 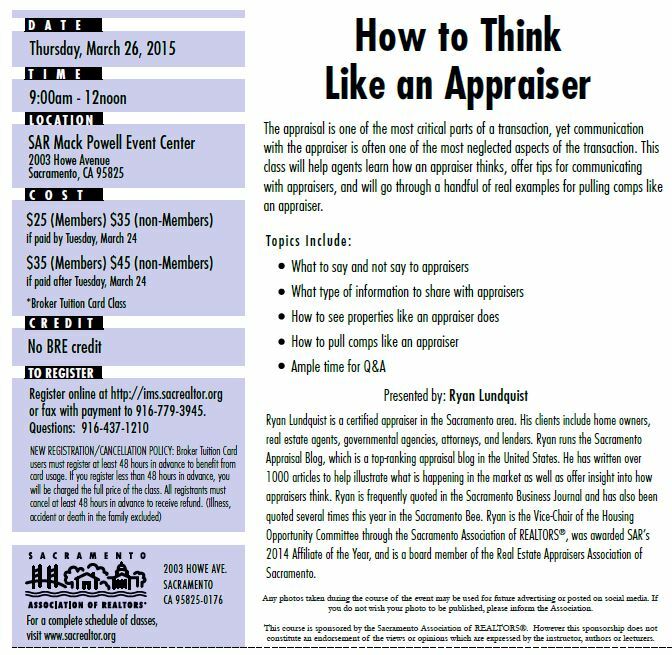 How to Think Like an Appraiser: I’m excited to be teaching a class in a couple days at the Sacramento Association of Realtors. The class is called “How to think like an appraiser”, and we’ll hit on how to choose comps, how to make adjustments, and tips for working with appraisers. This will be very practical, and we’ll have many case studies to talk through in the class. See the image and register online here. Question: What other signs do you watch to know if the market is increasing?